Samsung Galaxy Tab A 10.5 Launched with Modest Specs and $380 Pricing - Playfuldroid! 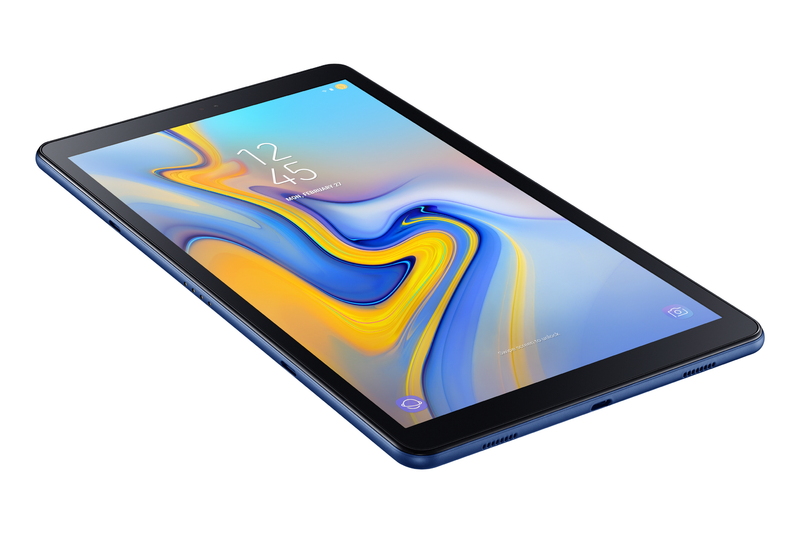 Apart from announcing the Galaxy Tab S4 with topnotch specs, Samsung had also unveiled a low-end tablet called Galaxy Tab A 10.5. Designed for casual use, the tablet is packed with modes specs and comes with an affordable pricing. The Galaxy Tab A 10.5 is fitted with a 10.5-inch TFT screen that produces Full HD resolution of 1920 x 1200 pixels. The bezels surrounding the display slim like the Galaxy Tab S4. The Snapdragon 450 is present under the hood of the device and it is coupled with 3 GB of RAM. It includes an internal storage of 32 GB. For more storage, it offers its users with an expansion storage slot. Like the Galaxy Tab S4, the Tab A 10.5 is blessed with a massive battery of 7,300mAh battery that can be charged through USB-C. The frontside of the Galaxy Tab A 10.5 has a rear-mounted camera of 8-megapixel with LED flash. For shooting selfies, it has a 5-mgeapixel frontal camera. The Android 8.1 Oreo is preloaded on the tablet along with Samsung Experience UX. There is a Kids mode on the device that allow children to use it with restricted features. The tablet is also equipped with Dolby Atmos sound. The Galaxy Tab A 10.5 comes in colors like Blue, Grey and Black. The Wi-Fi only model of the tablet is priced at $380. Its LTE variant carries a price tag of $450. It is expected to hit the market along with the Galaxy Tab S4 on Aug. 24.